The Manekineko (translated as beckoning cat but also known as the Japanese Fortune or Lucky Cat) is a very popular symbol of good luck in Japan. 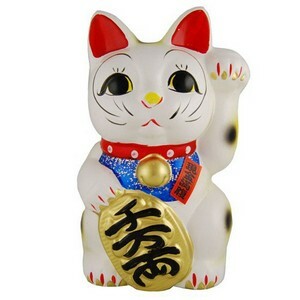 This traditional style lucky cat has a white body (brings good luck) and has its left paw up (brings customers/visitors)! She is holding a coin with kanji for 1000 Ryo (the old Japanese currency). This cat has a slot for money so can be used as a money bank. Made in Japan.